The safety of our students is the University’s primary concern. As a result, classes are canceled effective 6:00 p.m. today, September 11, 2018 and will resume Monday, September 17, 2018. Students may leave voluntarily without penalty. 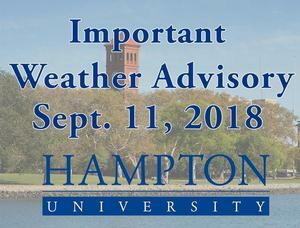 If you choose NOT to remain on campus, please go to https://secure.hamptonu.edu/dpae/ to complete the electronic form, notifying the University of your location. All university sponsored events and athletic competitions are canceled through Sunday, September 16, 2018. Students who will remain on campus and students who reside off campus but feel more comfortable sheltering on campus should report to Holland Hall beginning at 8:00 a.m. on Wednesday, September 12, 2018. Students will be transported by bus to Holland Hall. Residence Hall directors will provide residents with specific instructions. Residents with cars in lot 32, behind Moton Hall; Lot 9 behind the Hampton University Museum; and on Indian Road in front of Holmes Hall should move their vehicles to higher ground parking areas in Lots 10, 11 and to the downtown Hampton parking garage in the Hampton University building. Keep your cellular telephones charged and be certain to carry your charger. Please make certain that you have a two week supply of your daily medications. This is especially important for conditions like high blood pressure, asthma, diabetes, depression and anxiety. Also, notify the Health Center if you have a chronic medical condition that will require attention while sheltering in Holland Hall. The University will continue to monitor nhc.gov or other official sources of weather information. All additional notifications will be posted on the University’s website, in the residence halls and emailed to your University issued email address. Be safe and make good decisions about your personal well being. - Know where your roommate is at all times or have information as to where he/she is going. If you are going to be away from the building, tell the Residence Hall staff where you may be located. If possible, leave a telephone number or cellular phone number where you may be reached. You should also go to https://secure.hamptonu.edu/dpae/ to officially notify the University of your location. - Close and lock all windows and doors. - Unplug and secure all electrical devices and equipment. - Secure any valuables in the trunk of your car (if appropriate). - Exit building by the nearest stairwell. - Walk quickly to the site to which you have been directed. Information and all directives will be updated regularly with the Residence Hall Directors. Please follow their directives.